Join Equal Pay Today! 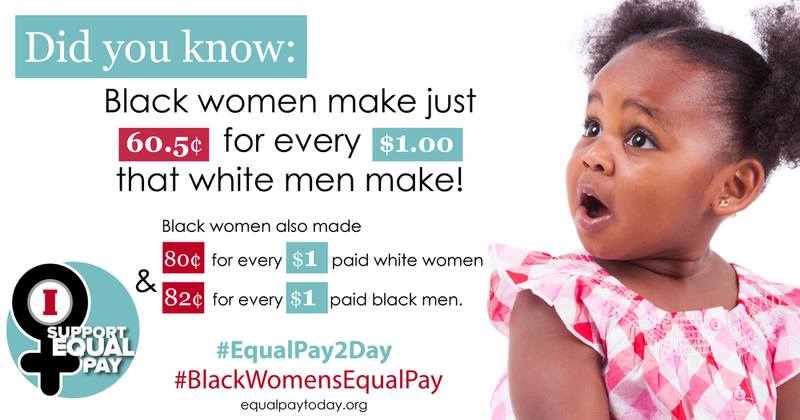 Campaign Organizations and other women's rights advocates for a Black Women's Equal Pay Day Twitter Storm on Tuesday, August 23rd at 2:00 - 3:00 pm ET. 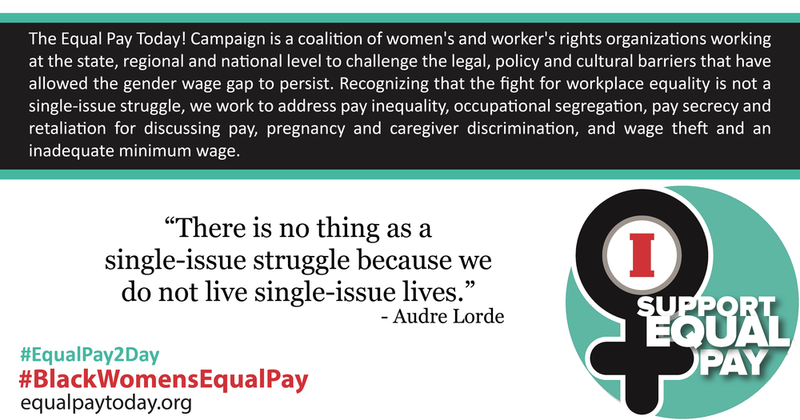 For the greatest impact, follow and join the conversation using the hashtags #BlackWomensEqualPay, #60Cents, and #EqualPay2Day. Follow @EqualPay2DayOrg on Twitter and like us on Facebook. 9to5 (Denver, CO), A Better Balance (New York, NY), ACLU Women's Rights Project (New York, NY), American Association of University Women (Washington, DC), California Women's Law Center (Los Angeles, CA), Equal Rights Advocates (San Francisco, CA), Gender Justice (St. Paul, MN), Legal Aid Society- Employment Law Center (San Francisco, CA), Legal Momentum (New York, NY), Legal Voice (Seattle, WA), Mom's Rising (Greater Washington, DC), National Center for Law and Economic Justice (New York, NY), National Employment Law Project (New York, NY), National Partnership for Women and Families (Washington, DC), National Women's Law Center (Washington, DC), ROC-United (New York, NY), Southwest Women's Law Center (Albuquerque, NM), Women Employed (Chicago, IL), Women's Law Project (Philadelphia, PA).